In response to the deteriorating security situation, Sweden is taking steps not only to enhance its warfighting capability but also to increase the resilience of society. The government appointed a Defence Commission in 2017 to look beyond current issues with a view to calibrating the country’s future defence policy and posture. A recent report from the Commission focuses specifically on the need to prepare the whole of society for the worst-case scenario of war. The Swedish approach has many similarities with the principles of resilience found in Article 3 of NATO’s founding treaty. Sweden works closely with the Alliance in many areas including civil preparedness. The seven baseline requirements set out in the Resilience Commitment agreed by Allied leaders at the NATO Summit in Warsaw in 2016 provide valuable guidance in developing national resilience. The security situation in Northern Europe has deteriorated since Russia’s illegal annexation of Crimea in 2014. There is now a growing realisation among NATO members and partners alike that challenges to European security and the rules-based international order must be met by rapidly transforming our defence postures and preparing our societies for the hardships of armed conflict. Deterrence and reassurance built on increased cooperation and joint action are necessary steps, but on the national level, every country must also improve their societal preparedness to meet this new security environment. Consequently, the key priority of the present Swedish Defence Bill, passed in 2015, is to enhance the warfighting capability of the Armed Forces. This includes the development of a Total Defence concept encompassing both military and civilian defence in a whole-of-society approach to security. The present Defence Bill started a new trend in Swedish defence spending. For the first time in more than two decades, the government decided to increase defence expenditures. 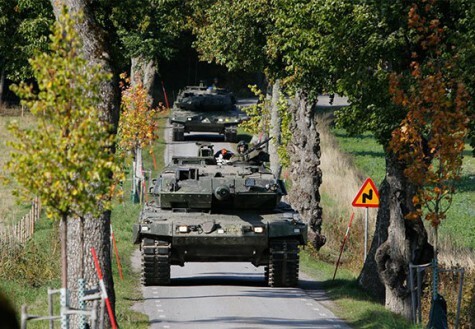 In 2017, the government further strengthened the defence budget, re-activated conscription and decided to re-establish a military presence on the island of Gotland in the middle of the Baltic Sea. An important part of the 2015 Defence Bill was to resume Total Defence planning. Sweden was arguably one of the most militarised states in Western Europe during the Cold War and had a systematic and well-developed Total Defence concept encompassing all of society. As a part of the post-Cold War peace dividend, most of the Total Defence planning stopped. Instead, Sweden prioritised expeditionary capabilities and crisis management. As a result, for many years now, there has been no systematic planning or preparation for the government ordering raised alert or wartime conditions, not least on the civilian side. Sweden now faces the challenge of resuming its Total Defence. Given Sweden’s previous defence policy and transformations in society over the years, it is challenging to restart the Total Defence. Swedish laws may be the same, but Swedish society operates on very different terms than it did during the Cold War. There is a need for strategic direction and defined ambitions to succeed in the planning and preparation efforts. Restarting the Total Defence requires a comprehensive social reform. In January 2017, Swedish Defence Minister Peter Hultqvist appointed a Defence Commission with the explicit aim to clarify the strategic direction for the coming Defence Bill of 2021-2025 and to achieve broad political support for the future development of Sweden’s security and defence policy. The Commission serves as a forum for consultations between the government and representatives of the political parties in parliament. The Commission’s task is to look beyond current issues and to recommend policy measures to calibrate Sweden’s future defence policy and defence posture. Its reports serve as important input in the work leading up to the new Defence Bill. In December 2017, the Commission delivered its first report “Resilience – the total defence concept and the development of civil defence 2021-2025” to the Minister of Defence. The report sets out the ambitions and principles for a reformed Total Defence concept that prepares Swedish society to meet an armed attack. As the security situation has deteriorated, it is clear that Swedish society needs to prepare systematically and comprehensively for the worst-case scenario of war. What are the challenges ahead in re-developing Sweden’s Total Defence concept? Over the last few decades, Sweden has gone through considerable societal change. For example, the country is highly dependent on a “just-in-time” economy that is vulnerable to disruptions in the continuous flow of electricity, information, transportation and financial transactions. Disturbances in the flow of goods and services will quickly impact large parts of society. Digitalisation has meant considerable changes to society and our daily lives. Systems for electronic communications are not designed to operate in war-like conditions and cyberattacks pose a real threat. Public services that the government previously operated are now under private ownership. These changes are important considerations when re-establishing Total Defence planning. Sweden’s current laws and regulations give a far-reaching set of legal instruments to mobilise necessary resources in society to maximise defence efforts. Swedish law defines Total Defence as the planning and measures required to prepare the country for war. The Total Defence concept entails that when the government orders the highest state of alert, all functions of society are engaged in the defence effort, both military and civilian. Accordingly, the parliament, the government, government authorities, municipalities, private enterprises, voluntary defence organisations as well as individuals are all part of the Swedish Total Defence. In a severe security crisis, it may take a relatively long time before the international community is able to provide support to Sweden. Meanwhile, Sweden must have the capability to defend itself and endure the hardships unaided. Therefore, the Commission suggests that the basis for the Swedish Total Defence concept and related planning will be a capability to resist serious disturbances to the functioning of society for three months. During part of this time, the scope of planning and preparations should be to manage an armed attack and war. In such a situation it will be necessary to quickly transform society and mobilise military and civilian resources to strengthen the defence efforts. This may take up to a week. In the worst-case scenario of war, disruptions in the flow of electricity are likely and will quickly impact large parts of society. Actors responsible for critical services in Sweden will be required to build independent emergency power solutions to secure access to electricity supply. Beyond preparing society for a crisis or war situation, individual citizens also have to take responsibility for managing their basic provisions and care for a week without public support. Government agencies need to focus on those who cannot care for themselves, while simultaneously mobilising society for the war effort. This is an important signal to the population from the Commission. A strong Total Defence begins with the willingness of the population to participate in the defence of the country. Awareness of crisis and war is necessary to withstand the initial shock and to resist an attack. Residents and decision makers alike must be aware of what wartime conditions may require of them. Moreover, it is increasingly important to actively protect open society, the rule of law and our sovereignty. The government has already pushed forward with one of the Commission’s proposals for a new agency with the general responsibility to develop and coordinate the country’s psychological defences. This entails, for instance, combatting disinformation and ensuring the transmission of public information. In order to mitigate the hardship suffered by civilians in case of armed attack, plans have to be prepared and resources committed for civil defence in peacetime. Civil defence will consist of personnel in regional reinforcement pools for the rescue services and a home protection organisation in the municipalities, as well as shelters and plans for the evacuation of specified areas. Both public and private sector employees will be a key asset in the Total Defence efforts. For example, the Commission proposes that staff in central government agencies, municipalities, county councils and designated private enterprises should be assigned roles in the Total Defence planning. Staffing in the civil defence will to a large extent be based on these employees working in their regular functions. Voluntary defence organisations will also have an important role in the civil defence organisation. Furthermore, in a severe security crisis or war, it will be crucial to secure necessary and reasonable access to food, potable water, energy and pharmaceuticals. Certain strategic foodstuffs will have to be stored. Methods for prioritisation will have to be developed in most sectors with critical operations. This is also important for the application of laws concerning rationing. It will also be essential to ensure a strong cyber capability. However, in an armed attack, the supply of electricity will most likely be severely limited. Actors responsible for critical services will be required to build independent emergency power solutions to secure access to electricity supply. Total Defence planning and preparation must be done with awareness of the fact that electricity and electronic communications failure is likely. Many sectors and operations are dependent on the transportation infrastructure. The Total Defence plans must include the storage of fuels to strengthen resilience in the sector. The capability to receive international support, both civilian and military, is also an important factor. The highly specialised Swedish healthcare system is organised for peacetime conditions. A transition from regular operations to coping with mass casualties needs to be prepared and practised. In wartime, the number of wounded may reach tens of thousands. Such a situation would severely strain any healthcare system. Planning ought to begin with the principles for healthcare in crisis and war, focusing operations on providing sufficient care to maximise survival rates. Private enterprises are increasingly important for the Total Defence effort. According to Swedish law, businesses are required to participate in the Total Defence planning process. The Commission suggests that key companies should be identified and designated. In close dialogue with private enterprises, public actors should assess the necessary preparations for disposition and rationing, as well as other measures to secure preparedness. Another finding in the Commission’s report is that the circulation of cash in Swedish society has diminished rapidly in the last few years. However, in crisis or war the population must be able to perform basic economic transactions. Consequently, it is necessary to have access to cash, alternative means of transaction or some sort of credit to uphold basic economic relations. This is important to maintain the population’s focus on the defence effort. Therefore, the government must be able to ensure the availability of cash even when there are severe disturbances in the payment system. In conclusion, the Commission presents a number of suggestions aimed at increasing Sweden’s Total Defence capability and resilience. Taken together, the proposals amount to a far-reaching reform of society. In a security crisis or an armed conflict being prepared is of utmost importance. Dr Björn von Sydow is Chairman of the Swedish Defence Commission. Previously he served as Minister of Defence (1997-2002) and Speaker of the Parliament (2002-2006).